SOG® Trident Tigerstripe Folder Knife. Deploys in a blink of an eye! The Trident uses SOG's well-proven means of delivering a knife blade to the open position with S.A.T. (SOG Assisted TechnologyTM). Now using their patent pending Arc-ActuatorTM, the Trident locks stronger and releases easier. There is also a built-in safety to lock the blade closed. When it shows red, you are ready to go. What also makes the Trident so unique is the patent pending GrooveTM in the handle, which allows the operator to cut paracord, fishing line, etc. without having to open the blade. The handle also includes a Digi-GripTM variable pattern for coarser grip in areas that require it. Our bayonet style clip is easily switched for right / left hand carry or removed for pouch storage. SOG's unique cryogenic heat treatment process increases the toughness and wear resistance of our blades. Taking the knife slowly down in temperature to less than -300°F and then back to room temperature. This stress relieves the material on an atomic level and increases overall strength as well as edge retention. Knife edges stay sharp longer with significantly less micro-fracturing and edge-chipping. Its this dedication to making your knife SOG sharp that sets us apart from the rest. SOG Assisted Technology works through the balance of opposing high-tension coil springs. As one opens the blade the force to propel the knife open becomes greater than the closing force and the blade will open on its own. The end result propels the blade out once the operator has initiated the one-handed opening action. S.A.T. works so well that right-handers can use their left hand equally well to open a folding knife (of course this works oppositely for lefties). 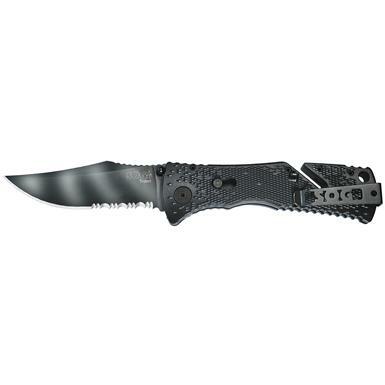 Blade Length: 3 3/4 x 1/8"
SOG Trident Folder Knife, Tigerstripe is rated 4.6 out of 5 by 35. Rated 5 out of 5 by USMC5811 from excellent knife for the past 13+ years. I have had this knife for over 13 years now and has been used for a little bit of everything. From cleaning wild game mostly deer and trout to working in my plant cutting wire or anything else I may need to do. It will be getting sent back to the factory to have the springs replaced and the serrated edge sharpened. Other then that I have had no problems with it. Thanks guys for making such an awesome knife. Rated 5 out of 5 by Bagsy from Great sailing/kayaking knife Bought this knife three years ago and it hasn’t let me down. Take this out sailing, kayaking and whenever I’m on the water. Great buy! Rated 2 out of 5 by Danobri25 from Disappointed I bought this knifeabout two to three weeks ago . But after about a week of using it as intended it started to rust all over. I was really dissatisfied with this knife. It was my first SOG knife and I was disappointed with the quality of the blade. And it came out of the package not that sharp as it couldn't pass the paper test nor could it shave my leg or arm hair. Rated 5 out of 5 by Tags from Got Lucky! Not very much experience with knives, but I needed one that day (fishing trip), too many to chose from, for some unknown reason I picked this model without hesitation. The truth is I already had decided on the SOG brand (did my own research). It work out, very happy! Rated 4 out of 5 by TheDudeInFlorida from Great knife for the money. I purchased this knife out of necessity. The just I had at store I worked at pretty much required that I have a pocket knife. And the time I had another knife, that just wasn't up to the task. However, my SOG definitely is. I've had it for probably going on 8 years, and my only complaint is the blade has a little lateral wobble in it. But aside from that, it's gone camping, hiking, been to several different jobs, and has always done right by me. I would definitely recommend this knife, or anything from SOG really, to anyone who finds themselves in need of a high quality blade. Rated 4 out of 5 by whitestar1864 from After 9 years one minor issue I purchased this knife in 2007, and have carried it on a daily basis since then, and have used it for every conceivable task. The automatic opening has always worked perfectly, as has the piston lock. The knife takes an edge easily and holds it well. It fits my hand perfectly, and the handle is easily held, and has never slipped out of my hand even when muddy or wet. The knife cuts exceptionally well. After nine years of daily use, the safety is malfunctioning, it clicks on or off as it moves in my pocket, and no longer holds firm. This is a minor issue, and fixed with a flip of the thumb when it inadvertently locks the blade from opening. Since it has developed a minor issue, I could not give it a perfect rating. Otherwise, a perfect knife that has given long and reliable wear. Conquer civilian tasks using military tech!